William Jones was born on this day, 28 September, in 1746. His father, also William Jones, was a mathematician from Anglesey, but living in Westminster when his son was born. Unfortunately William Jones, the father, died when William Jones, the son, was just three years old. He was raised by his mother, educated at Harrow and at University College, Oxford. 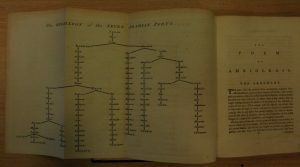 Though interested in mathematics, Jones’ zest was for languages and he learnt English, Welsh, Greek, Latin, Persian, Arabic, Hebrew and the basics of Chinese writing from a young age. On graduating from Oxford, he needed employment and so worked as tutor to seven-year-old Lord Althorp, the son of Earl Spencer. 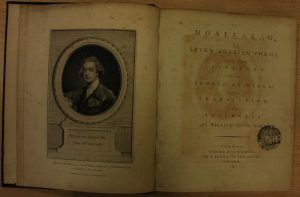 For the next six years he worked as a tutor and translator during which time time he published Histoire de Nader Chah (1770), a French translation of a work originally written in Persian undertaken at the request of King Christian VII of Denmark. In 1770 Jones studied law for three years. After a spell as a circuit judge in Wales, and a failed attempt, alongside Benjamin Franklin, to resolve the conflict that eventually led to the American Revolution, he was appointed puisne Judge at the Supreme Court, Fort William, on 4 March 1783, knighted on 20 March, married Anna Maria Shipley in April, and arrived in Calcutta to take up his post on 25 September 1783. He founded the Asiatic Society in 1784 and over the next ten years headed up the Society and produced a considerable number of works on India. As a linguist/philologist he was interested in the possibility of a common root to Indian and European languages and though he was not the first to posit the idea, he is generally credited with being the father of comparative linguistics. Jones died on 27 April 1794 at the age of 47 and is buried in South Park Street Cemetery, Kolkata. 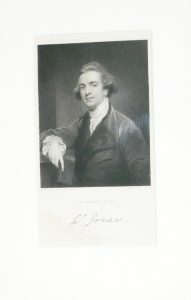 We have two engravings of William Jones in our Collections. The first is after Sir Joshua Reynolds, engraved by William Holl and published by Fisher, Son & Co., London, in 1833. This hangs in our Lecture Theatre. The second is by the artist, Arthur William Devis, who was based in Calcutta. This was engraved by William Evans and published by Edward Orme, London, in 1788. Devis was in India in 1784 having been appointed draughtsman on the East India Company packet, Antelope, under Captain Henry Wilson. He was injured in an encounter with Papuans and then wrecked on the Pelew Islands before proceeding to Canton and from there to Bengal. Presumably he met Jones during his time in Bengal and undertook the painting. So the painting would thus show Jones as a man of 38 years. An original portrait by Devis is held in the British Library Collections – this engraving, to my mind, portrays him in a more sympathetic light. 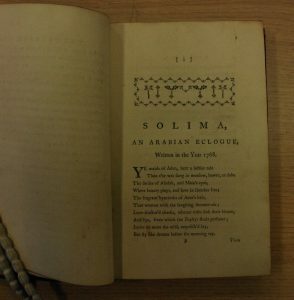 Being something of a poet myself, I was pleased to find that we have in our collections some of the books which reveal Jones’ interaction with Arabic and Sanskrit poetry. 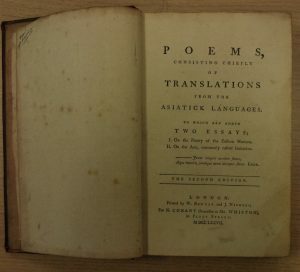 The earliest one is “Poems consisting chiefly of Translations from the Asiatick Languages to which are added Two Essays” which, in its second edition, was published in 1777. 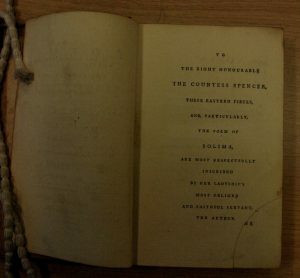 The book is dedicated to the Countess Spencer, whose son he had been tutoring. I’m not sure if you will be able to read them from the photos – our blog has a way of reducing the quality of the image. But, of course, you are welcome to come and see the book in our Reading Room. The second book I found was “The Moallakat or Seven Arabian Poems which were suspended on the Temple at Mecca; with a Translation, and Arguments. By William Jones, Esq.” This was printed in London by J. Nichols in 1783. 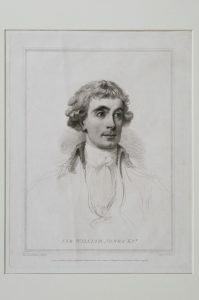 The frontispiece shows another illustration of William Jones, this one engraved by J. Hall from an original picture in the possession of William B. Sumner and painted by Joshua Reynolds. 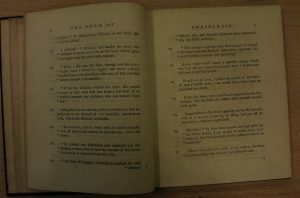 Again, if you are interested, do come and see the book in more detail in the Reading Room. 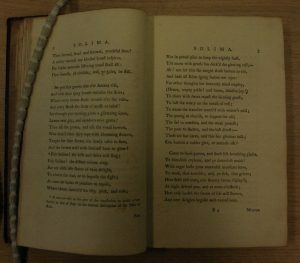 The final book that I took from our shelves was “The Seasons: A Descriptive Poem, by Cálidás, in the Original Sanscrit”, published in Calcutta in 1792. 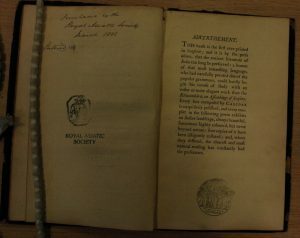 The Advertisement inside the book claims “This book is the first ever printed in Sanscrit”. Whether that is true or not, the book was deemed important enough to have been purchased by the Royal Asiatic Society in 1833. 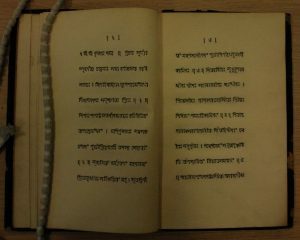 Here is an example of the Sanskrit typeface. So, if you are out for a meal or a drink this evening, or over the weekend, add into your celebration a thought for William Jones, linguist extraordinaire. Next Thursday, 4 October, at 6.30 pm, Dr Rosie Llewellyn-Jones will lecture on “‘My Dear Schomberg’: Letters from Sir Aurel Stein” in which she investigates the relationship between Aurel Stein and Colonel Reginald Schomberg and their parts in the last act of the Great Game. Please join us for the lecture on this intriguing subject.